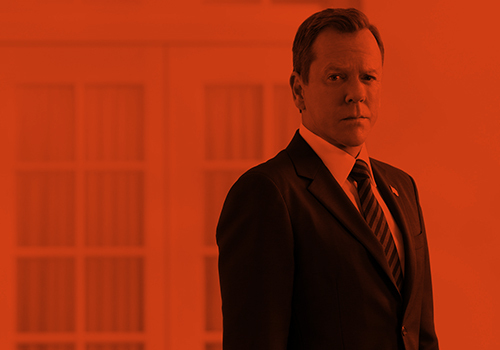 24: Live Another Day debuts Monday (May 7) with a two-hour premiere from 8 to 10 p.m. on Fox. The conference call, from New York, actually was broken into two segments, a very short portion on Wednesday that was canceled because of telephone issues on Sutherland’s end, and then a half-hour session with journalists from all over the country (questions and news organization precede Sutherland’s answers; if you don’t see them now, it means I couldn’t understand the name over the phone, but this blog will be updated in a few hours when the transcript becomes available). The Dallas Morning News: With all the phone problems yesterday, our first thoughts were, “Dammit, Chloe! We only have five minutes! Get this fixed.” [“Dammit, Chloe” was an oft-uttered epithet on the old show. Mary Lynn Rajskub returns as the character in the reboot.] Also, if this is successful, would you consider doing more of these limited 12-episode seasons, which are becoming more popular on cable, network and Internet shows? Kiefer, chuckling: “The questions I usually got [about the show’s technology] were about how my [Jack’s] cellphone never seems to fail. Well, let me tell you, my cellphone, Kiefer Sutherland’s cellphone, wasn’t working at all yesterday.” As for the possibility of another season or more, “That’s not something I would ever say ‘no’ to categorically,” but there are a lot of factors that would have to be considered. TVLine.com: How do you separate the wheat from the chaff, getting the best (or worst) 12 hours of Jack Bauer for this? Kiefer: “We’ve managed to take the 12 episodes and make them as concentrated and focused in the storytelling as possible. … Before, we always kind of ran into an issue in the storytelling in episode 14 or 15, trying to turn it for the last eight [in a 24-episode season]. Niagara Frontier Publications (Western New York): How did you approach this iconic role the second time around? And what’s Bauer’s motivation to even come out of hiding and do this, as mad as he was when the last season ended? Kiefer: “I felt really confident about the eight seasons we had done, and there was no different approach for me. We weren’t trying to retell the story. … It was just kind of getting back into the character and the nervousness of opening up the can again.” As for Bauer’s motivation, Kiefer didn’t want to spoil too much, but let’s just say there’s a threat that could easily set off World War III, and he’s worried for his family, President James Heller (William Devane) and Heller’s daughter Audrey (Kim Raver), “who’s kind of the love of his [Bauer’s] life,” and all that plays into his decision to go back into action. The New York Times Syndicate: Did you get a lot of questions about the show in odd places, when the show was on the air and now that it’s coming back? And why do you think people are so obsessed with Jack Bauer? CNN.com: What happened to the plan for a 24 movie, and how is this series different from what had been planned for the film? Also, how has Jack changed in these four intervening years, and how is he the same? Kiefer: ”It’s a very different script than we had for the movie. … I couldn’t exactly tell you why it didn’t happen, but then Howard [Gordon, one of the executive producers] came to me with this.” As for Bauer’s personality: “There’s a very strong moral compass with Jack. Whether he is right or wrong, he’s going to do what he thinks is the right thing, at the risk of his own life. … It’s very structurally different” in that before, he’s always started out, at least, working under the auspices of a government agency or the president. “This season, not only is he working on his own, the people he’s trying to help are actually hunting him, trying to kill or arrest him. He’s harder and I think angrier than he’s ever been,” from having had to hide out in Eastern Europe for all that time, away from his daughter, grandchildren and the country he thought he had been serving. There’s also a dramatic shift in the relationship between Jack and tech-whiz Chloe, Kiefer teases. Examiner.com: How did you jump back into the character after four years away? The North Texas Daily (the campus paper of the University of North Texas): What’s been the most pressure you’ve felt in your career? Kiefer: “It centers around 24. Certainly by the end of the second season — very rarely do you get that, captured lightning in a bottle, and there was a real pressure to continually make it better … that comes from within. … When we finished the eighth season, I think my shoulders dropped 3 inches … there was a relief” in knowing that pressure was off. TVWise.co.uk: Was the early success in the United Kingdom key to the series’ success, and how did you feel when you found out this one would be shot here? Kiefer: ”It made me smile. If there was one place that I thought deserved the attention [of having the shoot there], it was London. It was a hit out of the box there … 24 was on the fence [for a second-season order] and I think the success in Europe, and ultimately in Japan as well, were instrumental for the pick up. A part of me felt that London was very fitting” for the new iteration. Rock On Request Magazine: Jack’s always had an adversary who at first is working by his side, but then sets up roadblocks and becomes an enemy, the character we love to hate. Can you tell us who that’ll be this season? Premier Guide Media: If you were as skilled as Jack and a similar event to one he routinely faces took place, would you fight or take flight? This entry was posted by Eric on Friday, May 2nd, 2014 at 2:42 pm. It is filed under 24: Live Another Day, Interviews. You can follow any responses to this entry through the Comments Feed.